Death in Paradise–a terrifying thought. Surely there must be places from which death is banished. But one of the most famous paintings hanging in the Louvre is about shepherds, a cast shadow, and the presence of death in the pastoral landscape of Arcadia. 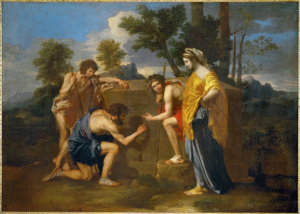 Painted by Nicolas Poussin (1594-1665) in 1640*, the Louvre version of the theme of the presence of mortality in a place called “Arcadia” is very dramatic, presenting the intense scene of discovery. The three shepherds, who stand for innocence surprised, are overcome with the realization that Death is speaking through an inscription carved on a tomb, intoning, “Et in Arcadia Ego.” The enigmatic phrase, seen only in part, is usually translated as a warning and a revelation, “..even in Arcadia, I am there.” Death is everywhere and spares no one. Three shepherds, wearing brightly colored togas, have paused (and posed) in a landscape of ancient Greece to examine a tomb unexpectedly looming before them. The sequence of the shepherds and their poses indicate, reading from left to right, a dawning realization of the significance of the warning carved in stone. The shepherd on the left bends over his companion, who has crouched before the tomb. This second shepherd casts a sickle-shaped shadow across the face of the slab and traces the carved words with his finger. The third shepherd, who is flanking the tomb on the right, has seen the inscription and has turned to a monumentally calm female figure. Clearly, she is of a different social class from the herders and possesses a knowledge that they have just discovered, and seems to be already aware of the inevitability of mortality. She places her hand comfortingly on the shoulder of the shepherd who turns to her beseechingly. This unnamed female is obviously an allegory but her meanings are still being debated. The narrative, frozen in time, is metaphorical of post-Paradise, post-Edenic conditions when post-lapsarian humans have realized that they will die, that their existence will end. 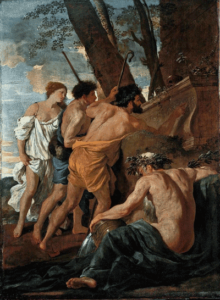 The theme of Poussin’s famous painting is deeply existential, suggesting that it is death and death alone that gives meaning to life, but there is another layer to the interpretation that attracted the attention of the contemporary photographer John Pfahl (1939-) and that is the idea of an Arcadia itself. Traveling across histories and cultures, the ideal of a memory space that holds the promise of a time when a perfect harmony between humans, the animals in their care, and nature itself, Arcadia is the beckoning lost dream. Arcadia for the Romans was the countryside, unspoiled, inhabited by equally unspoiled herders of domesticated animals and farmers tilling the soil. For the Romans, Arcadia existed in the past but also beckoned as a promise of the future and a return of a Golden Age. Here in Arcadia, humans lived simply and guilelessly, free of the cynicism and sophistication of an urban existence. It is no accident that Arcadia emerged on the eve of Rome becoming an empire and of the city itself becoming an urban destination teeming with jostling people. Green space was diminished, trees were supplanted by insula, and lakes and ponds by public fountains. The world had become an artifice, removed from authenticity and from nature itself. 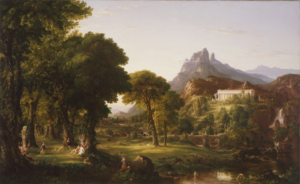 What happens to the cultural consciousness when the refuge that is Arcadia is lost? when the hope that is Arcadia has been wiped away? If death can exist in Arcadia, what does it do to an ideal that has itself died at the hands of humans? The photographer does not necessarily answer the profound question of the loss of a dream but he shows what this loss looked like in1980s America. Arcadia is no more. But when the photographer John Phafl revisited the Jeffersonian Arcadia, he did not journey to farm country of soft corn spikes or dripping honey. Instead, he walked the paths of industrialization and recorded a territory that has become separated from nature and from all that is natural. The photographer noted that the landscapes of the eighteenth century, divided into the picturesque and the sublime, just as Jefferson created a dialectic between manufacture and the pastoral, had to be reconsidered in contemporary terms. Leaving the picturesque to other photographers, Phafl sought the sublime, but this sublime is what is termed the “industrial sublime” or sometimes the “technological sublime.” As early as 1980, he began recording the toll the mastery of nature in the name of progress had taken on Jefferson’s Arcadia, in his series, Power Places (1980-84) Next his journey In 1988, took him to the historical heart of all that Jefferson feared, industrialization; and yet, this is the kind of industry that is not sterile but cornucopian. Phafl turned his camera towards the kind of industry or manufacture that used nature to produce power. But, as Jefferson would have pointed out, the power is then transformed into a witch’s brew that fuels cities and makes industrialization possible. 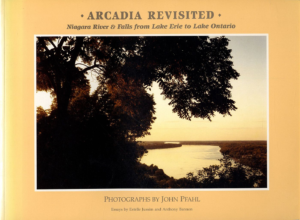 His photographic essay, Arcadia Revisited: Niagara River and Falls from Lake Erie to Lake Ontario, is a vision of nature that is always in his time “altered,” as he termed it. The altering is by the human hand a labor of a slow and steady remaking of nature to human needs and even to the danger and detriment of the contemporary society that has so proudly mastered nature. The themes of loss and transformation and the threat of death appeared in the photographer’s investigation of the industry along the Niagara River, and his exploration of nuclear power plants in America, a place that had once been a possible Arcadia. *The date, as decreed by the Louvre’s Pierre Rosenberg, is generally accepted today. 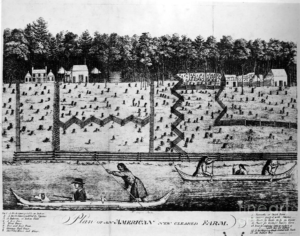 The next two essays will discuss Phafl’s twin studies of what Leo Marx termed “the machine in the garden,” referring to Arcadia, Jefferson’s pastoral ideal and, of course to Eden itself.